Tomorrow is a magical day at your local comic book shop. You can walk into the store, load up on some comic books and walk out without paying ... completely legally! That's right, it's Free Comic Book Day, and many comic book publishers are offering very special issues of some of their hottest titles for fans to enjoy without paying a dime. This event has taken place since 2002, after retailer Joe Field was inspired by Baskin Robbins' "Free Scoop" night. For an ailing industry, it seemed like just the ticket: If it works for ice cream, why not? 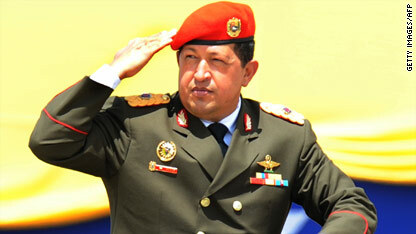 – This year, Seth Rogen will star as the Green Hornet in a major motion picture. However, this is hardly the first time Hollywood has tried to bring the Hornet to the big screen. At one point, writer/director Kevin Smith had a script for a big-budget treatment of the classic radio character before dropping out, reportedly due to getting cold feet about such a big undertaking. As Smith told EW.com, he was approached to try a new take on the Hornet and ended up putting his script to the comic page. The Green Hornet #1 is the first part of that effort, and having read it, I can say it's definitely an intriguing story so far, about a Hornet for a new generation. – For G.I. Joe fans, it doesn't get much better than Larry Hama's treatment of the characters, which started in 1982 for Marvel Comics. After Joe fever died down, the series ended with the 155th issue (now highly sought-after by collectors). G.I. Joe #155 1/2 is Hama's attempt to continue that story after the G.I. Joe team has shut down and Cobra runs rampant. Should be very interesting reading. – And now for one of the classics. If you watched the Fox Saturday morning lineup back in the 1990s, you should be very familiar with the Tick. You may have even seen the short-lived, critically acclaimed prime-time series in 2001. Now readers can see where it all began with a special reprint of The Tick #1, especially for Free Comic Book Day. Spoon! – Invariably, Free Comic Book Day is timed to coincide with a major comic book-based motion picture release. This time, it's "Iron Man 2." Marvel has a possible sneak preview of the upcoming "Avengers" movie with Iron Man/Thor, as the two heroes team up for a special free story, promising a "bold new direction" for both characters. 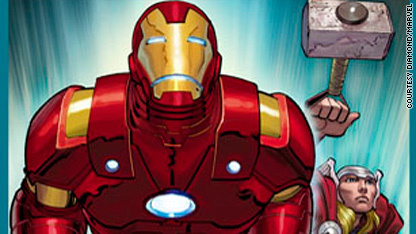 Younger readers are encouraged to read old Shellhead's adventures in Iron Man: Supernova. Like I said, there's more where that came from, but that should get you started. Happy reading! It was already at reality-show proportions. But the tech feud between Apple and Adobe continues to escalate as Adobe responded Thursday to Apple CEO Steve Jobs' sharp criticism of its Flash player format. The gist from Adobe: So what? We have other friends to play with. "... Given the legal terms Apple has imposed on developers, we have already decided to shift our focus away from Apple devices for both Flash Player and AIR. We are working to bring Flash Player and AIR to all the other major participants in the mobile ecosystem, including Google, RIM, Palm (soon to be HP), Microsoft, Nokia and others," Adobe's chief technology officer, Kevin Lynch, posted in a blog on Thursday evening. Lynch said that he still holds out hope Apple and Adobe can work together on the mobile Web. "We could provide a terrific experience with Flash on the iPhone, iPad and iPod touch," he wrote. This comes after Jobs posted a missive about flaws with Adobe's Flash. He said the format leads to crashes, hinders app development and doesn't work well with touch-screen devices. 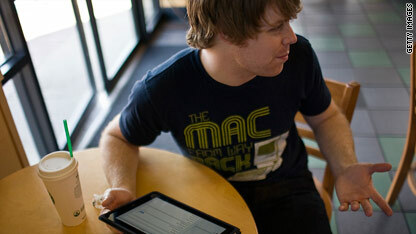 That's why Apple does not support Flash video or games on the iPad, iPhone or iPod, he wrote. 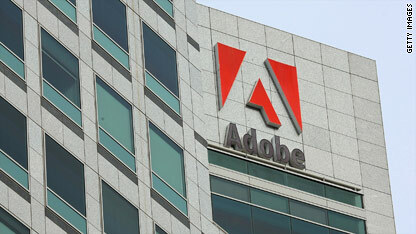 Adobe says it has other plans for Flash. "We look forward to delivering Flash Player 10.1 for Android smartphones as a public preview at Google I/O in May, and then a general release in June. From that point on, an ever increasing number and variety of powerful, Flash-enabled devices will be arriving which we hope will provide a great landscape of choice," Lynch wrote. Now that both companies have weighed in - all blog style - who do you side with? Read the source material for yourself (Apple | Adobe) and let us know in the comments. Several of you posted yesterday that you thought Steve Jobs was right to snub Flash. Google is trying to bring the Web to your living room. The search engine giant plans next month to unveil a new software package to help developers better display the internet on TV sets, according to the Wall Street Journal, which quotes unnamed sources familiar with the announcement. 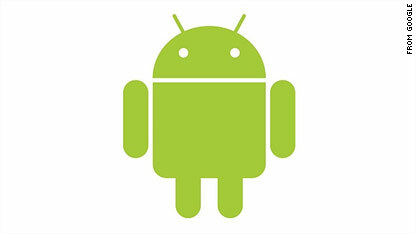 Google TV, an android-based software platform, has drawn interest from TV makers, the Journal says. Google is expected to break the news at the Google's I/O conference, which will be held May 19 and 20 in San Francisco, California, the newspaper reports. At the conference, Sony also will announce a TV that runs an Intel chip and Google's software, Bloomberg reports. In an e-mail to CNN, a Google spokesman declined to comment, saying, "We don't comment on rumor or speculation." This comes as the idea of "connected TV," or television sets that let people browse the Web for video, news stories, video conferencing and to stream music, continues to get a push from electronics and internet companies. 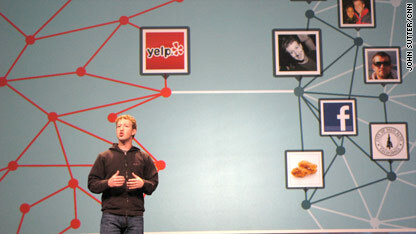 A number of companies are developing apps, or software programs, that format the Web for optimal viewing on TV sets. Some are creating hardware to help with the transition, too. 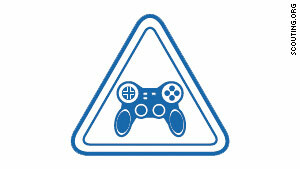 Editor's note: Geek Out! posts feature the latest and most interesting in nerd-culture news. From scifi and fantasy to gadgets and science, if you can geek out over it, you can find it on Geek Out! 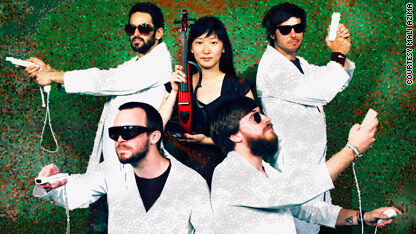 Look for Geek Out! 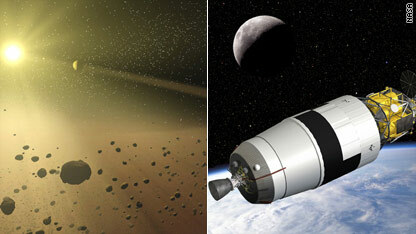 posts on CNN's SciTech blog. This work of art has a logic to its beauty: It was inspired by a branch of mathematics called hyperbolic geometry. Daina Taimina, adjunct professor at Cornell University, has been making these crochet creations since 1997, both for teaching and for aesthetic value. Taimina remembers that when she was a student of non-Euclidian geometry, her instructor would tell the class to imagine the concepts being studied. “Why should I trust something I can imagine?” Taimina asks. She wanted to be able to construct something that would represent the complex ideas of higher mathematics. 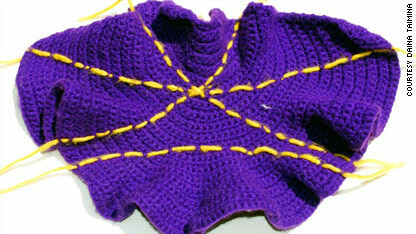 When she began teaching non-Euclidian geometry, crochet allowed her to explain concepts not on a blackboard or computer screen but in something tangible. Most middle school students are taught Euclidian geometry, which puts forth that if you have a line and a point outside of it, there is only one other line you could draw that would could go through the point and also be parallel to it. This is the case for a two-dimensional plane, on a flat piece of paper, for example. But in hyperbolic space, that is no longer true. “This is something you can really can see only after have crocheted it,” Taimina says. This model illustrates the point: In this space, there are three lines going through the point that will not intersect with the fourth line on the bottom. The models Taimina uses for instructional purposes take about 10 hours to make. 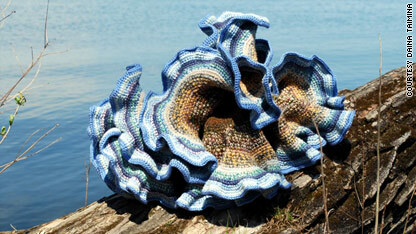 Her largest crochet work took eight months to construct. 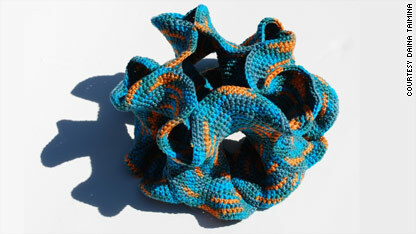 “In some ways I feel like I’m making sculptures with crocheting,” she said. 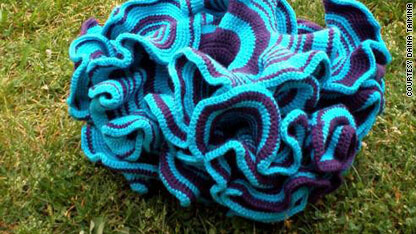 “I’m interested how long you can crochet the same shape over and over.” The image above is an example of a manifold, which can be folded into an infinite number of shapes without distorting the geometry of the surface. "Hyperbolic geometry" may sound esoteric, but there are plenty of real-world applications. It describes how skin grows on wounds, so plastic surgeons must be aware of it; for example, in reducing the visibility of scarring after surgery, Taimina said. It also plays a role in computer animation. 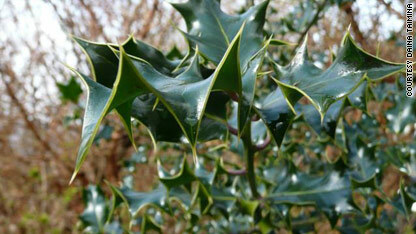 In nature, you can see hyperbolic geometry in nature all the time, from kale to sea kelp to the holly pictured above. To learn more, visit Taimina's Web site.